The Passieg de Gracia is Barcelona’s grandest boulevard. And when I say grand I really do mean grand. If Barcelona’s streets were a family then Las Ramblas would be the noisy kid brother always getting into scrapes and mischief and coming home with muddy knees whereas Passieg de Gracia would be the beautiful and sophisticated elder sister sipping on a cocktail with an air of superior elegance. It is a street which knows it is too good for you. Nevertheless it is going to have to put up with your gawping for a while because walking down it is one of the highlights of any trip to Barcelona. I would not advise beginning your visit at the metro of the same name because it is one of those metro stations that has been designed by a person who believed that there is nothing more enjoyable in life than climbing stairs and walking down tunnels. People have designed mazes that are less difficult to get out of than Passeig de Gracia metro station. I’m convinced if you walk around it for long enough you’ll bang into a minotaur. Instead I would recommend beginning at the top of Plaza Catalunya diagonally opposite from where you started walking down Las Ramblas yesterday (if you read my blog post about it and I’m sure you did). You are about to encounter the yang to Las Ramblas' ying. Passeig de Gracia has wide spacious pavements and so unlike other popular streets in Barcelona it never feels too crowded. You feel that you can stop and look up at a building without having a large group of schoolchildren trample over you. And you are going to want to look up because some of the buildings are magnificent. The patterned wrought iron balconies, the delightfully contrasting facades and the occasionally frivolous roofs. 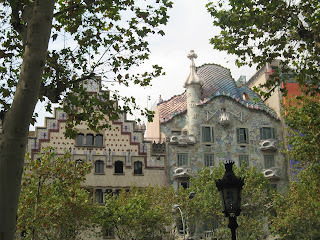 Before I came to Barcelona I didn’t even know roofs could be frivolous. Just walk along taking it all in. Pretty soon you will go pass at fountain at the intersection with the Grand Via. The BigBarcelonaBlog likes fountains almost as much as it likes water slides and every grand street needs a good fountain. On your left you will pass La Borsa (the stock exchange). Should there have been a recent demonstration against the financial crisis and austerity, this will be daubed with anti-capitalist graffitti (Passeig de Gracia is traditionally where Barcelona’s protest marches are held – though the BigBarcelonaBlog has been on a couple of these demonstrations and the word “march” is not really appropriate - “occasional painfully slow shuffle punctuated by long periods going nowhere” being far more accurate). Depending on whether you are one of the 1% or one of the 99% you will either shake your head angrily or nod supportively. Or you could kind of shrug if you think austerity is obviously a bad thing but graffiti is probably not the best way to fight it. The BigBarcelonaBlog is probably a shrugger. Having spent a moment musing on the world’s impending political and financial catastrophe you’ll probably fancy being cheered up. That’s fine because just five more ambling minutes down the road on your left you will arrive at the Manzana (Block) de Discordia. The Block of Discord is four extraordinarily flamboyant modernist buildings built side-by-side by four of Barcelona’s best architects, each of which are very different in style but somehow complement each other wonderfully. It is one of my favourite sights in Barcelona. For those of you who like facts they are Casa Lleó-Morera by Luis Domenech i Montaner, Casa Mulleras by Enric Sagnier, Casa Amatller by Josep Puig i Cadafalch and Casa Battló by a certain Antoni Gaudi. 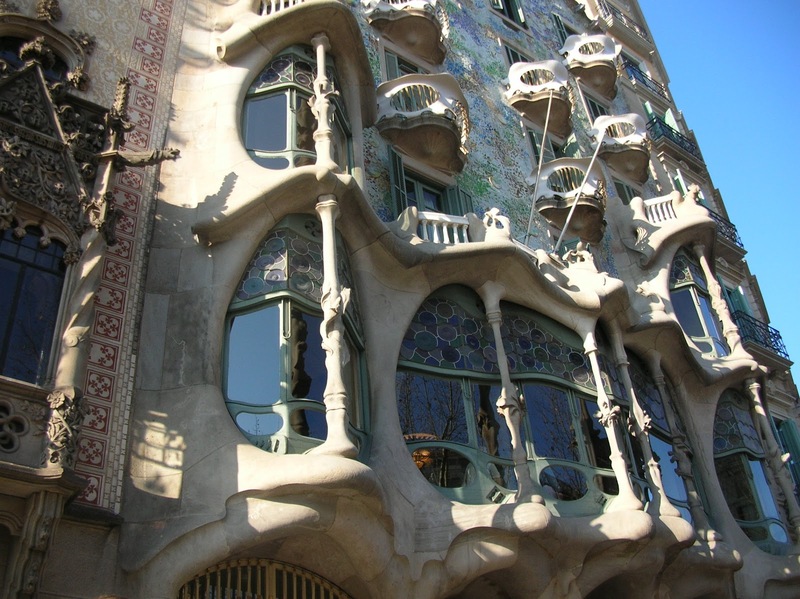 For those of you who like idle speculation, I suspect the other three architects really wanted to punch Gaudi. It’s like putting on a play in 16th century England that you think is really good and then finding out that the theatre next door is premiering a new work by a guy called Shakespeare. For good as the other casas are, Casa Batlló is genius. And that’s just the outside. The inside is better. It costs 18 Euros to go in and it worth every cent. While we are on the subject of entry fees. You will of course have noticed that the BigBarcelonaBlog is free but if you did want to buy it a cerveza you could click on one of the adverts that are dotted around. It won’t take long and it will slake a thirsty blog’s thirst…Thank you! Back to the Batlló. Join that short fast moving queue and prepare to be impressed. What is so fascinating about Casa Batlló is to witness a great architect getting to grips with designing for normal life. We are used to seeing great artists work on great projects which while impressive often are a little removed from everyday existence. They are by their very nature special. To try another parallel it’s as if, after finishing The Sistine Chapel, Michelangelo’s next job was painting your living room. I think we can reasonably conclude he wouldn’t have done it in magnolia. Gaudi rises to the challenge of the normal effortlessly. The curved wooden staircase leads up to a first floor apartment that you could imagine moving into tomorrow if there wasn’t the drawback of all those tourists traipsing through your bedroom. Apparently it was built for a middle-class family which just goes to show that the word middle-class meant something entirely different 100 years ago. The large main living room has huge curved window that looks down onto the street below. The bedrooms lead out on to a cool patio. There are little nooks and crannies everywhere which show how much thought Gaudi put in to making the flat elegant and interesting and yet also perfectly functional. The curving wooden apartment is built around a cooling atrium of tiny blue tiles whose colour gradually change in depth and intensity as they rise to the roof. They are a wonderful contrast to the sensuosness of the wooden interior. The other apartments are closed to the public but the laundry rooms at the top and the roof above them aren’t. And the laundry rooms are worth the trouble. You look at me incredulously but really they are. 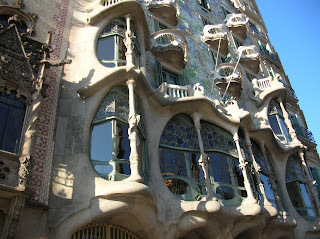 Because when Gaudi designed something he did it thoroughly. Airy space, cool tiles, white light. You just know your bed linen would be crisper and more comfortable if it were laundered up here. And finally the roof. Which actually isn’t that special. But it does have a pretty good view. And who doesn’t like views. Not the BigBarcelonaBlog that’s for sure. That’s the Casa Batlló. A couple of blocks further down you’ll come to La Pedrera which is Gaudi’s other masterpiece on the street (because obviously one wasn’t going to be enough). Even though this is the Unesco world heritage sight and therefore attracts the bigger queues I don’t think it’s anywhere near as good as the Batlló and think you can just take a photo of the outrageous but somehow menacing façade and be done with it. If you do decide to go in though (and I’m not saying you shouldn’t) the roof is fantastic. This brings you pretty much to the end of Passeig de Gracia. You could retrace your steps but I’d recommend walking for another five minutes until you reach the trendy, funky village within a city of Gracia (it’s where the street goes after all) where you can reward yourself with a drink and some well-earned tapas. Here you can reflect on what you’ve just seen. 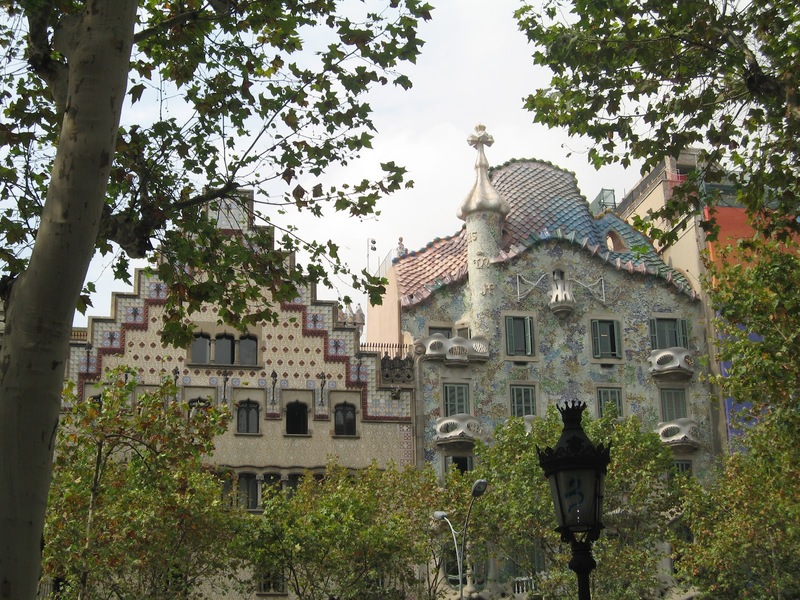 Passeig de Gracia is the centrepiece of the Eixample - Barcelona’s bold statement that it was breaking out of its narrow, cluttered, medieval confines and thinking big. Really big. It is a street that is at once ambitious and assured and occasionally astounding. It is a street which could only exist in a great city. ¿Dondé está el Passeig de Gracia? – Where is the Passeig de Gracia? ¡Qué grandiosa la calle! – How grand the street is! ¡Qué elegantes los edificios! – How elegant the buildings are! ¡Qué discorde la facade! – How discordant the facade is! Si te damos una franquicia y un mes de alquiler de antalación podemos instalarnos la lunes que viene – If we give you a deposit and a month’s rent in advance can we move in next Monday? Very favorite place in Barcelona. I saw one time. Travel notes shared here (gezi).